These are our favourites! Using ‘off the peg’ top quality made to measure carcases in combination with ready made doors (in any size or style) – we then add our own unique additions – if this is desirable. 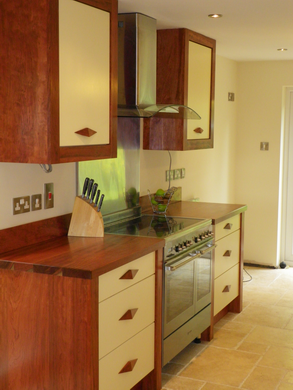 This provides a bespoke kitchen but makes best use of high value for money items wherever possible, thus keeping the cost to a sensible level. Our pricing is fair and transparent – and if you wish to employ other trades such as electricians etc – we don’t mind, provided they are properly qualified. We can liase with other trades or provide a full project management service. We compete favourably on price with most of the well known kitchen suppliers, whilst providing far superior quality and levels of customer service. Ask us today for a completely no–obligation quotation. We will NEVER EVER try to pressurize a customer into making a deal on the spot. We don’t need to do this anyway – we rely on our knowledge, innovative approach, and enthusiasm to close our deals.